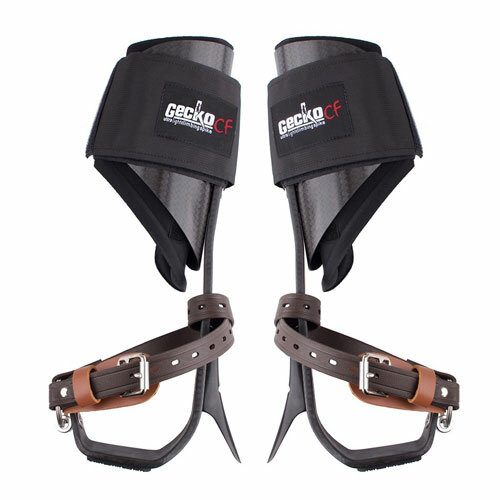 When Gecko introduced their Ultra Light aluminum climbers, it was assumed that a set of climbing spurs really couldn't get any better, or lighter. Well, the new Gecko Carbon Fiber climbers prove just the opposite. They feature a new and improved carbon fiber lay design, full adjustability and a best-in-class weight of just 3.7 lbs per pair! They even feature a Vibram stirrup sole plate for improved limb walking. Most customers agree, that despite the price, there really isn't a more comfortable pair of climbers on the market today. And hey, shaving ounces--or even pounds--off your climbing setup can really make a difference! What is the approximate processing & shipping time of this product if it were to be shipped to NJ? We are told these will be back in stock either late June or July. It's been a nationwide backorder and frustrating for customers and dealers alike. When in stock, these normally ship in 24hrs and have a transit time of 3-5 days. These are the best pair of spikes I have ever had in 20 years.